As part of its “Keep Learning” program, the Alumni Relations Office organized the second lecture for this fiscal year: “Serving Others as Key to your Personal and Professional Success” on Friday January 27, 2012 at the Business Building, Beirut Campus, Adelaide Vincenti Bahu room 903. 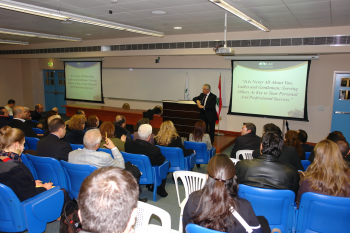 LAU President Dr. Joseph Jabbra presented the lecture. Over 100 alumni and friends attended the event, which was followed by a reception.